View a larger version of this image by downloading the PDF. A cross-divisional, staff-led team with broad representation has been appointed to ensure implementation of our Strategic Plan. Co-led by Jessica Knickerbocker and Josh Knouff, the Implementation Team will be responsible for ensuring that we reach our WHY and represent the HOW’s through prioritizing and implementing the initiatives. Focus teams for each initiative include staff from all divisions and varying levels of the department as well as a management sponsor. These teams will be responsible for the development of initiatives and identifying the tracking performance measures. Membership of the Focus Teams will change as one initiative is completed and a new one is started. Feel free to reach out to the Implementation Team members if you have questions or concerns. 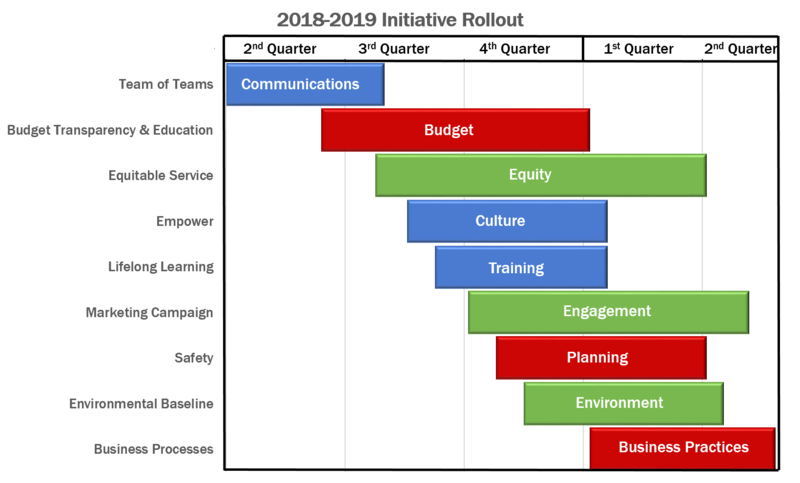 In 2017, the Director identified 12 Strategic Planning Team members, representing each division, to develop the 2018-2025 Strategic Plan. This team completed extensive research, listened to feedback from stakeholders, customers, and employees, and worked collaboratively to develop the plan and set the direction for our department. This Environmental Services Strategic Plan (and Appendix) will serve as our agenda and guide decisions for our department through 2025. As always, we are dedicated to working together transparently with open communication and contributions from all levels of the department. If you have questions or would like to provide feedback, please contact Josh Knouff, Jessica Knickerbocker, a member of the Implementation Team, or email ThinkBig@cityoftacoma.org.